Well, I did it. 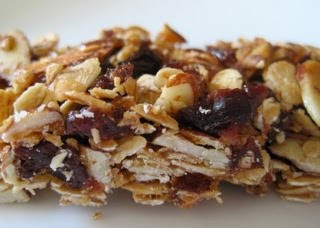 I tried out my granola bar recipe with the tweaks I thought might improve it. (But I didn't test my parchment paper idea as I totally forgot to get some from the store.) As you can see, the bars are worthy of the "granola" adjective now. They're not as sweet, and they definitely have a lighter texture that tends to crumble quite easily, which I attribute to the lack of agave nectar. Perhaps it's best to go according to the recipe on that one. The oats are much drier than the coconut, so I'm thinking they need that much more help sticking together. (At least agave, rather than corn syrup, is the glue!) And honestly, I'm not that bummed that they're falling apart—I managed to keep a few together, and you can be sure I saved the crumbly bits for my Greek yogurt. Sounds like post-workout snack perfection!